Thomas Klose was awarded the "Preis für gute Lehre 2015" (‘Humboldt Award for Good Teaching’) of the Humboldt University Berlin for his innovative and engaging teaching methods. This prize is endowed with 10,000 euros and, every year, it is awarded among all who lecture at Humboldt University across all disciplines for successfully implementing modern teaching concepts in the course of regular teaching. 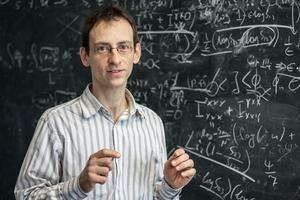 Thomas Klose received the award for his introductory course in Classical Theoretical Mechanics. This course is attended by Bachelor's students with vastly different backgrounds, ranging from students who major in Physics or Mathematics to those who major in Literature or Sports. To respond to such a heterogeneous audience, Klose utilized a large variety of teaching resources, all with the purpose of boosting the students’ activity during class time and not leaving anyone behind. For one thing, he created interactive videos with preparatory materials for the students to watch before class. In 10 minutes, they got an overview over the topics to come and from the anonymous answers to the interactive elements contained in these videos, he got an idea about what prior knowledge is safe to assume and what is not. For another, he built new and made use of existing classroom response systems where all course participants answer in an anonymous fashion to questions using their cell phones and similar mobile devices. This engages all students at the same time, allows them to instantly test their understanding of newly introduced concepts, and provides valuable feedback for the teacher on the learning success. Beyond that, it is by now standard for him to video record all lectures, which the course participants use to review the material, but which have also appealed to students from outside of Humboldt University.